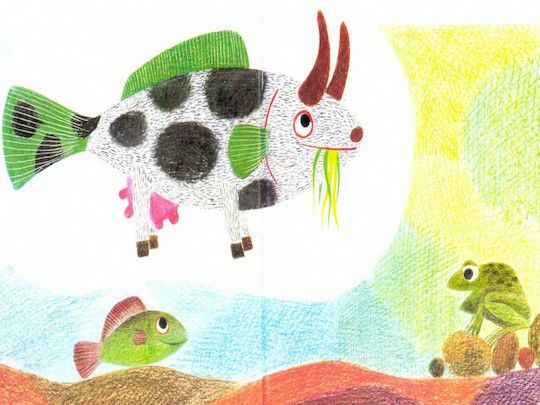 In his brilliant children’s book Fish Is Fish, Leo Lionni tells the story of a fish and tadpole who become best friends. Eventually, of course, the tadpole grows up, becomes a frog, and ventures out onto dry land. One day, the frog jumps back into the pond to see his old friend the fish. “I have seen extraordinary things!” the frog exclaims. As How People Learn explains, everyone has preconceptions about how the world works. Learning is rarely successful when parents or teachers tell students about the world without discovering and building on what children already know and believe. The understanding that children bring to the classroom can already be quite powerful in the early grades. For example, some children have been found to hold onto their preconception of a flat earth by imagining a round earth to be shaped like a pancake. This construction of a new understanding is guided by a model of the earth that helps the child explain how people can stand or walk on its surface. Many young children have trouble giving up the notion that one-eighth is greater than one-fourth, because 8 is more than 4. If children were blank slates, telling them that the earth is round or that one-fourth is greater than one-eighth would be adequate. But since they already have ideas about the earth and about numbers, those ideas must be directly addressed in order to expand or transform them. This is understandable — and good news, in a way. We humans deeply want to understand the world around us. To help us do so, we must build on what we already know. We must fit new things we’re learning into that knowledge; otherwise, new information is just a bunch of random facts that we can’t possibly really understand. But this also means that teachers and parents who want to help children grow in their knowledge and understanding must pay close attention and build on what children already believe. (By the way, the same is true when you’re arguing with Uncle Henry about politics.) Sometimes this means helping young people tear down and replace fundamental misconceptions about the world. Often, though, it’s possible to find and build on elements of their understanding that are valid and useful. Your child asks: How do airplanes fly? You start with a question of your own: How do you think airplanes fly? Your child wants to learn to play checkers: What do you already know about checkers? Your high school child is complaining about being stumped by a difficult math problem on their homework: What do you know about this problem? By starting with listening, you’ll be in a position help your child to evolve their thinking and build deeper understanding by building on what they already know.